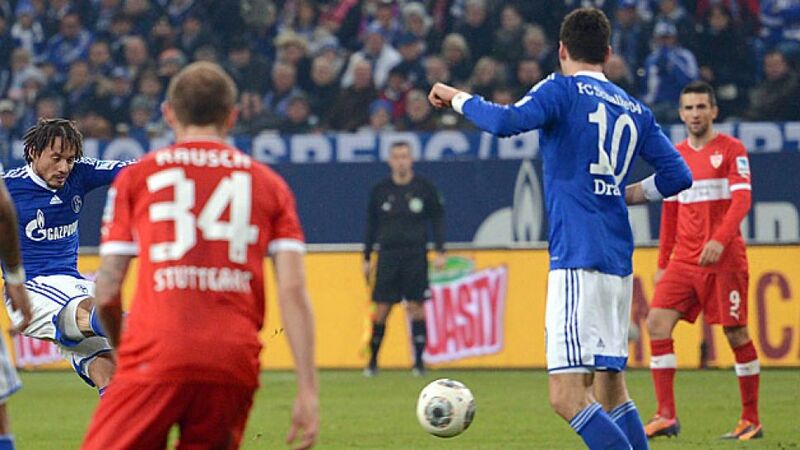 Gelsenkirchen – A convincing 3-0 home victory over VfB Stuttgart in Saturday's late kick-off took FC Schalke 04 up to fifth place in the table at the end of Matchday 14, confirming the Royal Blues' solid domestic form over the past few weeks. Jones himself spoke at length with the press at the Veltins Arena about the match, his goal and Schalke's tough upcoming schedule – as well as casting an eye ahead towards next summer's FIFA World Cup finals in Brazil. Question: Jermaine Jones, congratulations on the 3-0 win against Stuttgart. How important was that for FC Schalke? Jermaine Jones: Very important. We knew we had something to make good on after squandering a clear lead at Frankfurt and not making the most of our chances in Bucharest. Today, we did a good job of putting what we'd planned into practice. Question: What did you make of your own performance? Jones: The first quarter-hour wasn't good, I nearly helped Stuttgart go in front. After that I tried to play to my strengths and get the team going. Scoring the goal was a bit of payback for that early mistake and all-in-all we showed good team spirit and earned the win. Question: You don't often have the opportunity to celebrate a goal of your own. How did it feel? Jones: When you're not in the habit of scoring, you're not quite sure either how you're going to react. Kevin (Boateng) told me before the game that I was going to score – after that bad start, I was reckoning more with an own goal (laughs)! I didn't control the ball too well, but it was a perfect strike on the volley. Question: Who was the heart for after you scored – the club? Jones: No, for my wife. The goal was for the team and the club. Question: Jens Keller made a point of singling you out for praise. How much of a boost is that? Jones: It's always nice to hear things like that. For me, at the end of the day, the important thing is to keep focusing on my own performance. When I play to my capabilities, I can help the team. Question: How difficult have the past few weeks been for you? Jones: When you've been at a club for quite a while and been written off time and time again, and you're not getting the best level of support from the outside, it can be pretty tough. Obviously I'd like people to have confidence in me. But I'm someone who's going to keep working hard and won't give up. I think I demonstrated that here today again. Question: How do you see your own future? Jones: I'm not losing any sleep over it. At the moment I just want to play football and enjoy it. Everything else will follow from that. Question: How tough a schedule are Schalke facing over the coming weeks? Jones: It's pretty much one decider after the other. The DFB Cup game, then a difficult match against Gladbach and after that the Champions League meeting with FC Basel. We're looking to progress on all three fronts. Question: What's your take on the cup game against Hoffenheim? Jones: Hoffenheim are a young team who play good football. We need to stay focused and on our guard. If we all play as we can, it's going to be tough for them. We'll be going into the game in good spirits and off the back of a good win. After throwing away points at Hoffenheim recently, we want to show a different face this time at home, and qualify for the next round. Question: Changing the subject briefly, next week sees the draw for the group stage of the World Cup finals. You're in the mix there with the USA. Who would you like to see come out of the pot and which teams would you most like to avoid? Jones: It's my first World Cup finals and I'm not really bothered who we're up against. If I'm lucky enough to be part of it, I'm just going to enjoy every game. Question: Is there already a bit of mickey-taking going on among the various nationalities in the Schalke dressing room? Jones: Well, I keep joking that if we draw Germany we're going to beat them again. Obviously you'd rather steer clear of Germany, Brazil and the other big favourites, but that's hardly going to be possible. We're just going to enjoy the World Cup and take it as it comes.